If your dream has always been to buy a Trullo, we suggest you a little guide that explains you the main characteristics of this particular residence and its particular real estate market. Among the homes full of charm that distinguish some areas of Italy, surely the Apulian Trulli represent a characteristic dwelling that, due to the particular geographical location, allows you to choose whether to live in the green of the countryside or near the sea. Trulli are characterized by their cone shape and the use of local stone and whitewashed that determines the visual contrast with the colors of the surrounding nature. Traditionally used by herdsmen for protection against the elements or by farmers as storerooms, these remarkable roughly hewn buildings use an ancient drywall technique that involves no mortar. The traditional stone buildings of this southern Italian region, however, are those who have maintained over time, the typical original features and the relationship with tradition and have developed by adapting to modern living requirements, becoming a unique building of its kind in which to live today. 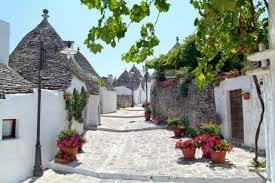 Trulli in Itria Valley have particular characteristics and are concentrated in the towns of Alberobello, Cisternino, Ostuni and Martina Franca. Located in the central part of the region, between the provinces of Bari, Brindisi Taranto, the trulli area coincides with the south-eastern part of the Murge.Now we take a detailed look at all you need to know about purchasing a Trullo, from how life is in different parts of the Itria valley to the market trends.First of all you need to know the purpose of your investment, if it is for living in Puglia or you want to full fit in a business at this point your question will be: how much would it costs to buy a Trullo? The market for Trulli in recent years has been characterized by a marked increase in demand, both on the part of an Italian clientele and foreign buyers, fascinated by the beauty of the Apulian countryside and the unique features of these homes that allow you to live immersed in nature, close to the sea, or in the middle of countries able to tie the traditions of the past with modern conveniences. Therefore, a slice of the market does not seem to be affected by the crisis and opens out with a particularly high concentration of British buyers, but also French and Dutch. The lowest average price, however, we find it in the province of Taranto, in this case € 1,300 / m². Essentially, the real estate prices of the trulli has had an upward trend in the price level, but accompanied also by an increase of the purchase application by both national and foreign buyers. Let's see in detail all you need to know about the sale of the trulli in the Itria Valley, focusing in particular on a few specific areas. OSTUNI (The White City)A very characteristic area where buy a Trulli is Ostuni, located in the province of Brindisi at the southern part of the Murgia, famous for the beautiful sea on which overlooks. Also known as the "white city" because of the lime with which many houses are painted. It is an attractive alternative for those who want to move to Puglia, or want to buy a home for the holidays.The average per square meter prices are a bit 'higher than those we saw earlier. For this type of real estate, the price is around € 1,800 / m², an increase of about 14% over the previous year.We are faced with a magical place, a wonderful glimpse that, situated at a height of about 200 meters above sea level, offers breathtaking views and at a distance of 8 kilometers, one of the most beautiful and cleanest seas the region and the country.In fact, for those who want to buy a vacation home or open a business in this place so characteristic, we recommend to choose from the Trulli in Ostuni where you can have a house a few kilometers from the historic center and at the same time from the sea, what’s better? CISTERNINO Another fabulous place to think about if you love the trulli and the magical landscapes of the Itria Valley, is definitely Cisternino. We are still in the province of Brindisi, in the southern part of the Murge, 394 meters above sea level, with wonderful views over the valley of the Trulli. If you love the less touristy places, but rich in history, simplicity and tradition, the best choice would a Trullo in Cisternino.Let see briefly what are the prices per square meter of Cisternino’s Trulli. For our particular type of property on average expected the price to date is 1,600 € / m² compared to € 1,550 / m² in the previous year same period.If you are interested in buying a home in a quiet area in the countryside of Cisternino, surrounded by nature and perhaps with a beautiful view of the valley, why not choose a Trulli to be restored? Obviously in this case the purchase price drop, but restructuring costs should be in an average range from 20,000 to 40,000 euro each cone depending on the square meters and on the conditions and interventions needed by the property.